The history of post-Roman Chichester is little known and it is likely that the main settlement in the area was around Pagham harbour, where there were extensive royal lands, especially at what is now Selsey. Wilfrid was granted some of these in 683 for the support of his newly founded monastery. This evolved into a cathedral and remained the seat of the bishop until c1075, when the cathedral was relocated in Chichester. Several largely deserted Roman towns were resettled in the later C9 and the fact that the first reference to Chichester in the Anglo-Saxon Chronicle was in 894 (1 p315) suggests that that is probably what happened at Chichester. It is certain that by the C10 it was a burh, a major town and in the later part of that century had one of the four regular mints in Sussex. Its early ecclesiastical organisation appears to have centred on one church, subsequently St-Peter-the-Great, which may be presumed to have been on the site of the later cathedral, as the parish continued to worship in the north transept until the mid-C19. This parish also covered an extensive area outside the walls. As the town prospered, new, smaller parishes were formed. Dates are few, but that of St Olave is early, probably before the middle of the C11. Most such parishes reflected highly localised interests and the dedication suggests that St Olave was founded by Scandinavians, presumably merchants. By the C12 there were eight parishes within the city walls and two, possibly three, suburban ones, though initially not all may have been fully separate. Two urban ones, St Peter-the-Great and St Pancras, extended into the suburbs. Five still stand – All Saints-in-the-Pallant, St Andrew Oxmarket, St Olave, St Pancras and St Peter-the-Great, which is a special case. Until the C20 there were two more. One, St Martin, largely dating from the early C19, was pulled down in 1906; the other, St Peter-the-Less, North Street, part C13, part C19, only in 1960 (see VCH 3 p163 for a plan). Two more, St Peter-juxta-Gildenhall and St Mary-in-Foro disappeared earlier, the latter being ruinous in 1582 (ibid p166). Their parishes were united with St Peter-the-Great. One suburban church, St Bartholomew, disappeared in 1642, probably during the siege by Parliamentary forces. The loss of St Sepulchre (as it was then known) is particularly sad, since it was apparently a round church. Taken with the dedication, this suggests that it postdates the First Crusade and was probably established in the early C12. The siege of 1642 had a considerable effect on the city for the rest of the C17 and beyond. Prosperity was slow to return and although the seat of the bishop, many citizens had strong Parliamentarian sympathies. A re-organisation of the parishes in 1656 was undone at the Restoration, but no immediate attempt was made to repair the damage. Perhaps instead, several dissenting chapels emerged. The other certain suburban church, St Mary, Rumboldswyke, covering the southern approach to the city, remained in use. It is also likely that Fishbourne, which still maintains a rather precarious separate existence as a village and parish (and is treated separately here) was originally a third suburban parish. None of these churches had been significantly altered between the early C14 and the C19, for the civic pride of other cathedral cities never touched Chichester. This may have been because until 1845 the city was under the authority of the Dean or the Archbishop of Canterbury as peculiars, though in most cases the parishioners were responsible for their churches. With the start of the C18, the economy of Chichester improved, as the fine houses, especially in the Pallant show. An Act of Parliament of 1723 reflected the view that the churches were too small ‘more especially for the lower orders’ (Horsfield II p15) This provided for St Mary’s Hospital to be used as a church, but like an alternative plan for one large central church, this came to nothing. Instead, St Pancras, which had also ceased to be used after the siege, was rebuilt in 1750, but barely larger than in the Middle Ages. In 1813 increasing population and the evangelical revival led to the building of a proprietary chapel, St John. A scheme to rebuild St Bartholomew encountered financial problems and was not completed until 1832. Four years later a large church, St Paul, was built in the northern suburbs and in 1852 a separate church for St Peter-the-Great was built. A parish was formed for the poorer eastern side at Portfield, until now in the parish of Oving and the church of All Saints dates from 1869. To the south, the city finally absorbed Rumboldswyke at much the same time. As St Mary, the mediaeval church was some way out, a large new one, St George, was erected in 1901. Two C20 churches, St Wilfrid, Parklands and St Michael, serve outlying districts, but otherwise the number of churches has reduced substantially; within the walls none remains in use. 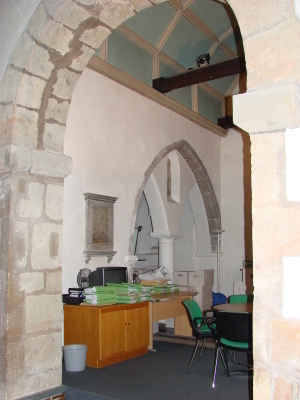 Various uses have been found for them with demolition in the cases of St Martin and St Peter-the-Less; St John’s passed to the Churches Conservation Trust. Outside the walls Rumboldswyke and Portfield also became redundant and have been adapted for other uses.